There are 4 reviews of Sunshine & Pancakes. I purchased a decant of this as a blind buy. I'm glad I did. Refreshing citrus & sandalwood. A rosy, wood smell. Fresh, blooming jasmine. This perfume is much brighter on top than I expected. The lemon really pops. It is an almost citrus soda accord. It becomes tart for me, tangy even. The jasmine becomes "tart" as well. Honey and musk creep in later. Neither are sickly sweet. They are together, a more natural-smelling blend. I detect no vanilla at all in the middle. S&P sparkles even more later, with benzoin making itself known. There it is now, the vanilla in the base, which is spicy, as it smells close to the skin. This perfume just gets better as time passes. Lovely and intriguing and long-lasting. Honey note stays the longest. It does smell like pancakes long after the top and heart notes fade. Fresh St. Clements on top of a lightweight jasmine and wood with a warm vanilla base. The orange and lemon topnote leans more toward lemon on my skin - it's sun-warmed rather than refreshing, but definitely doesn't go as far as syrupy sweetness. The topnotes don't particularly remind me of food, rather some kind of light citrus drink - the note isn't solid enough to be foody. The effect of the floral, wood and citrus together is one of lotioned-skin and the outdoors on a soft breeze. The vanilla adds even more warmth as well as a bit of weight and gives considerably more longevity than I expected from these topnotes. 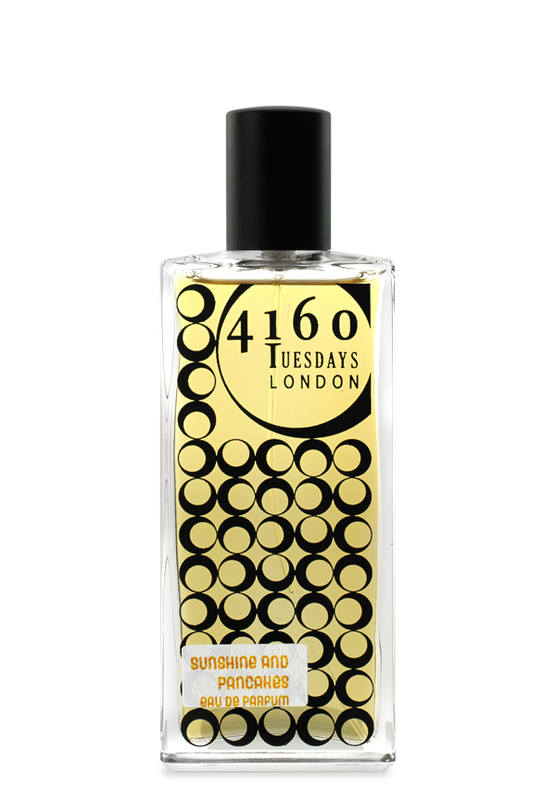 I found this fragrance a little more unusual than expected; 4160 do a couple of lemon candy frags, namely Mrs Gloss Lemon Sherbert and Tokyo Spring Blossom (which has a sherbert-lemon drydown) - this is less candied than either of those. Sunshine and Pancakes smells like summer on skin to me and it's one of the happiest fragrances I own. Sarah McCartney has a way of bottling a sense of joy. The opening's citrus impressions are pleasant but not particularly convincing. The real thing commences in the drydown, with its jasmine-wood combination raising the bar considerably. I get a reasonable jasmine, but the wood note is very well done indeed. I mainly get rosewood, and together with the opening it now enhances the too notes, especially when the slightly honeyed vanilla arrives that alludes to the comestible in the name of this product. This now vanilla-centred mix is what remains until the end, and all together is has indeed characteristics compatible with the smell of a pancake or muffin on the plate on sunny summer terrace. May a bit more orange marmalade on top? The sillage is moderate, projection adequate and I get seven hours of longevity. Yes, a sweetish summery, not refreshing but lingering on the sunny side of life. After a suboptimal start it gears up nicely. 3/5. Happiness in a bottle!! It really does smell like sweet sunny days!! Love it!! There are no member images of Sunshine & Pancakes yet. Why not be the first?